After his 1959 ride in the Little Joe 2 Spacecraft, Sam the Monkey is safely aboard a U.S. Navy destroyer. In this historical photo from the U.S. space agency, Sam, the Rhesus monkey, after his ride in the Little Joe-2 (LJ-2) spacecraft. A U.S. Navy destroyer safely recovered Sam after he experienced three minutes of weightlessness during the flight. 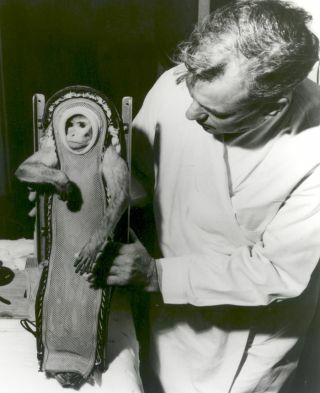 Animals were often used during test flights for Project Mercury to help determine the effects of spaceflight and weightlessness on humans. LJ-2 was one in a series of flights that led up to the human orbital flights of NASA's Project Mercury program. The Little Joe rocket booster was developed as a cheaper, smaller, and more functional alternative to the Redstone rockets. Little Joe could be produced at one-fifth the cost of Redstone rockets and still have enough power to carry a capsule payload. Seven unmanned Little Joe rockets were launched from Wallops Island, Virginia from August 1959 to April 1961.